Rainbow Mountain is this big sprawling summit west of Whistler, commonly frequently by heli-skiers, heli-tourers, and sometimes even snowmobiles. For some reason, I've never skied to the summit. 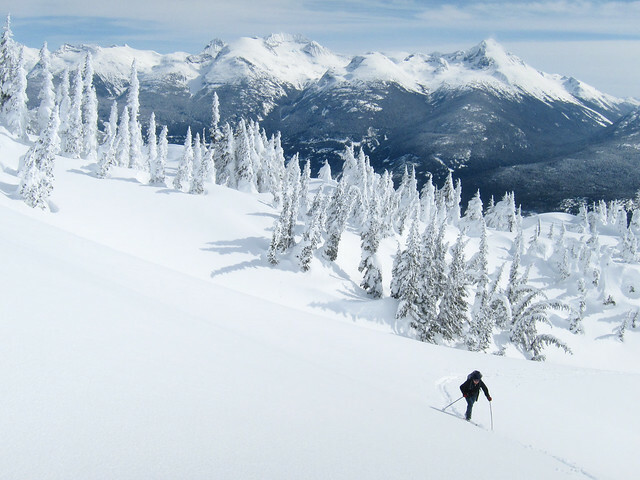 Perhaps I was secretly hoping that one of my friend's would invite me on a heli-drop on Rainbow, the style that many people seem to prefer for maximizing powder turns, or my distaste for Whistler Olympic Park and the snowmobilers around Hanging Lake. The fastest way to the top of Rainbow Mountain is via a helicopter, and I hear it's about the same price as a Whistler lift ticket. That gets you up into the alpine within 5 minutes, and leaves you with the rest of the day to ski north facing powder runs. The second fastest way is via WOP and Hanging Lake, but then you have to deal with all the snowmobilers who love that area too. 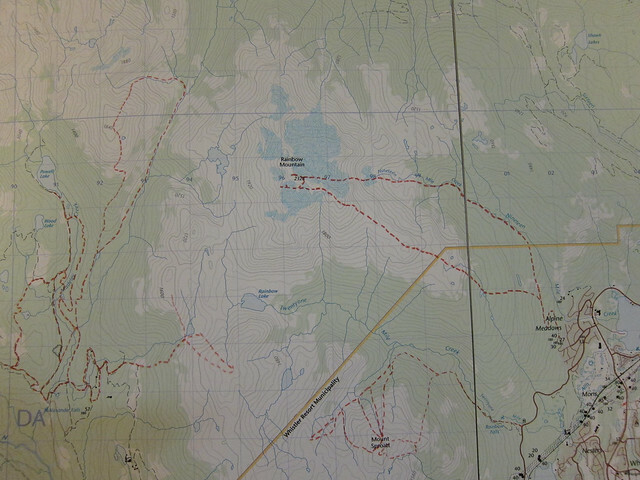 From the east, you can either go up either Nineteen Mile Creek, which we took, or Twentyone Mile Creek, which gets you to Rainbow Lake, but then you'll also have to deal with snowmobilers. 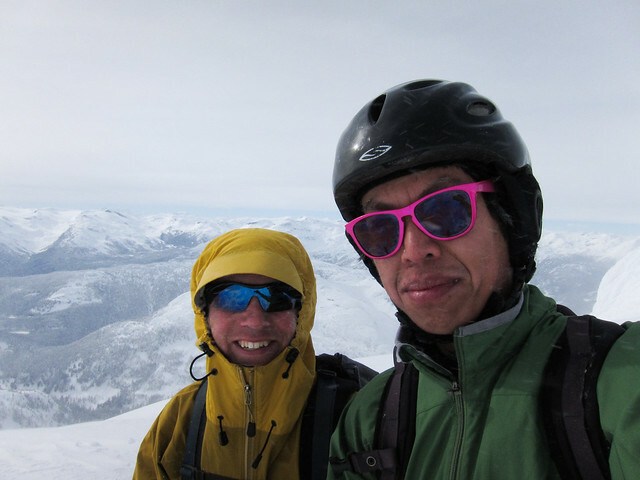 On Sunday, Tim and I went up via Nineteen Mile Creek, and then skied down the East Glacier. John Baldwin highlights this as a superb daytrip, and I would completely agree with that. This route takes you through some great old growth forest, the long rolling southeast ridge, up to the summit, a committing descent down the East Glacier, and finally through more beautiful forest at the head of Nineteen Mile Creek. We left the car at 9:30am, from the end of Alpine Way in Whistler. Despite the fact that we were both already in Whistler, it had been a disorganized morning, after all we didn't even plan to go skiing until 10pm the night before. I'm not sure about the parking situation here, and there are only a few plowed spots, and it seems to be the front yard of some guy's house. We left a note just in case. It was sunny and warm, and I had visions on napping in the sun on the summit on a beautiful spring day, and decided to leave my goretex behind. The route goes up a logging road, also part of the Flank Trail, and we left the road approximately 1km before a bridge over Nineteen Mile Creek. We took the first overgrown spur, but I suspect the second spur might be better. The idea here is to work your way up a steep cutblock to get to the old growth forest above. 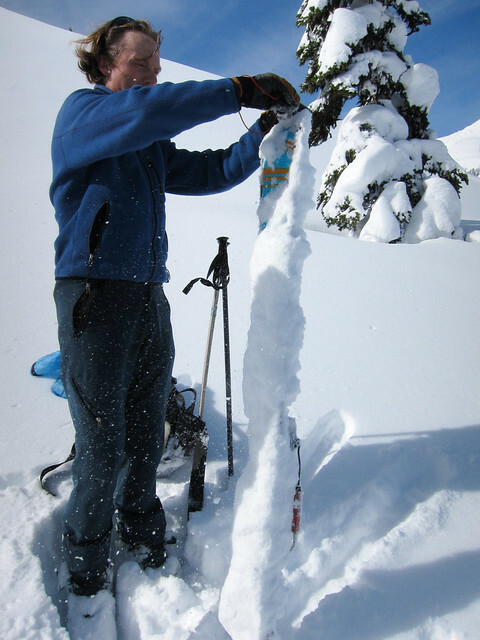 Instead of taking the big switchbacks through the cutblock, Tim opted to break trail up through steep second-growth, dealing with large treewells and near-isothermal snow at the same time. It was warm, we forgot skin wax, and ended up with massive globs of snow attached to our skins. So much for the idea of having "light" skis, instead we dragged around several extra pounds of snow on each ski. Next time, take the logging road through the cutblock, I think that's more pleasant. The highlight at the end of the cutblock is this massive tree with beautiful bark. Tim wishing we had skin wax. Trailbreaking through steep trees in the cutblock was a serious chore. Beautiful sub-alpine terrain on the southeast ridge of Rainbow Mountain. A short stroll through the forest then takes you up into the alpine, along rolling terrain on the southeast ridge. No snowmobilers, just two skiers and a flock of snow geese above. This route also gives you a good view of the East Glacier, most importantly a view of the steep headwall below 1800m. Don't ski over it! Tim and a view of the East Glacier. Soon the winds picked up, and the light winds forecasted for the day changed into strong northerly outflow winds. We passed through impressively wind scoured slopes, sastruged covered ridges, large cornices, and a massive wind cirque on the south side of Rainbow Mountain. We accidentally went too far down while trying to bypass a minor rock step. We re-orientated ourselves, and continued to the summit, constantly battling against the wind. Tim up ahead. My IT band has been giving me grief recently so I slowly followed him. We were on the top around 3:30pm, our high-speed quads are not quite as fast as a helicopter! Rainbow has been on Tim's list since he was fifteen, when he first spotted it across the valley from Singing Pass, so he seemed quite happy. With better snow conditions in the forest, and less wind, I think you could get up here in five hours or less. The weather showed no sign of improving, with darkening clouds on the horizon, and we didn't ski the North Glacier. I was glad that I didn't do a heli-drop on Rainbow Mountain today, as I would have been quite disappointed to pay to ski wind effected snow! We quickly took our self-propelled summit shot, hopefully MEC will use it in all their stores and website. It was way too windy up there for me to smile. I've been wanting to take this summit shot for a while now. We traversed back over to the top of the East Glacier. 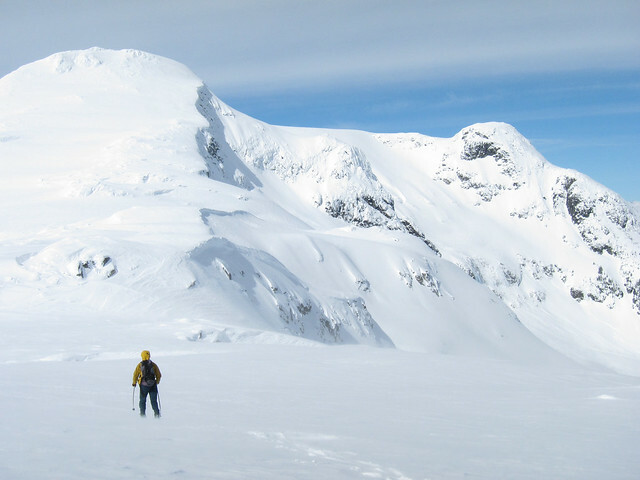 The idea is to ski down, and right, towards the toe of an obvious steep rocky ridge, without falling into some massive crevasses. 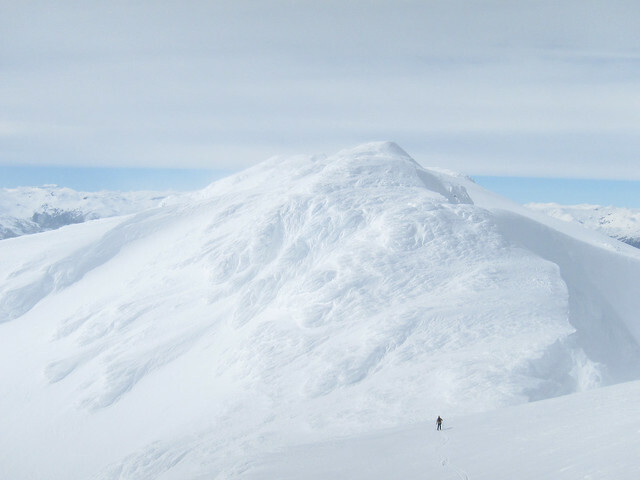 The route is also threatened by cornices, but we were lucky that they had already fallen off, creating a large avalanche off of Peak 2279 that ran all the way to the valley bottom. We worked our way down the glacier, following various ramps around large wind cirques. 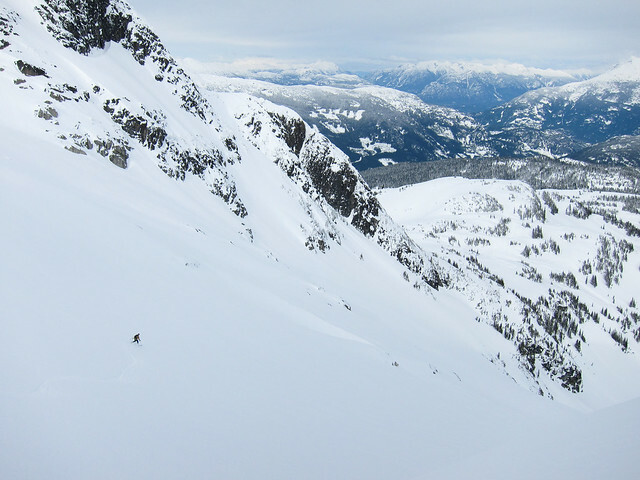 It's quite tempting to ski left, but that puts you above the headwall and frozen waterfalls. The skiing was great, mostly boottop powder, until the bottom where the light was so flat that I couldn't see what I was skiing. I should have brought googles. 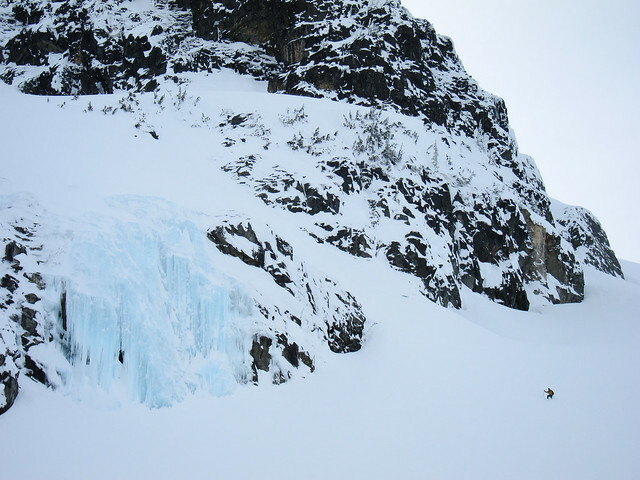 Tim skiing past a a waterfall on the lower half of the East Glacier. I didn't stop to take a photo, but there was a large Class 2.5-3 avalanche behind the rock rib triggered by cornice release. The debris was mostly covered. We finally saw snowmobiler tracks at the head of Nineteen Mile Creek, but these were nothing compared to the highpointing carnage around Rainbow Lake. The ski out through Nineteen Mile Creek was quite pleasant, rolling through beautiful old growth forest. After some quad-burning skiing on sunbaked snow on the logging road, we were back at the car by 6pm. A highly recommended and satisfying daytrip, and a nice line on the map wall! More photos here, nothing too exciting as the lighting was quite flat all day. Bannerizer makes it easy for you to promote ClickBank products using banners, simply go to Bannerizer, and grab the banner codes for your picked ClickBank products or use the Universal ClickBank Banner Rotator to promote all of the ClickBank products.